As part of my shower gift to the mom-to-be I made a super-hero cape for her older son. He has to this point been the only child so I wanted to do something to include him in the festivities and to help make him excited to be a big brother. He is really into Superman, so I decided to make him a similar style cape with his initial, "P", and "Super Brother" on it. 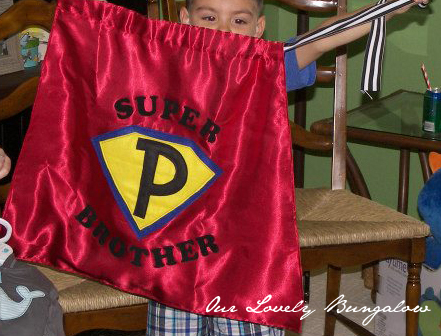 I bought some red satin fabric at Joann's for the cape and used felt I already had for the "P" emblem. I also bought iron-on letters for the "Super Brother" part. I first got to work on the "P" emblem. 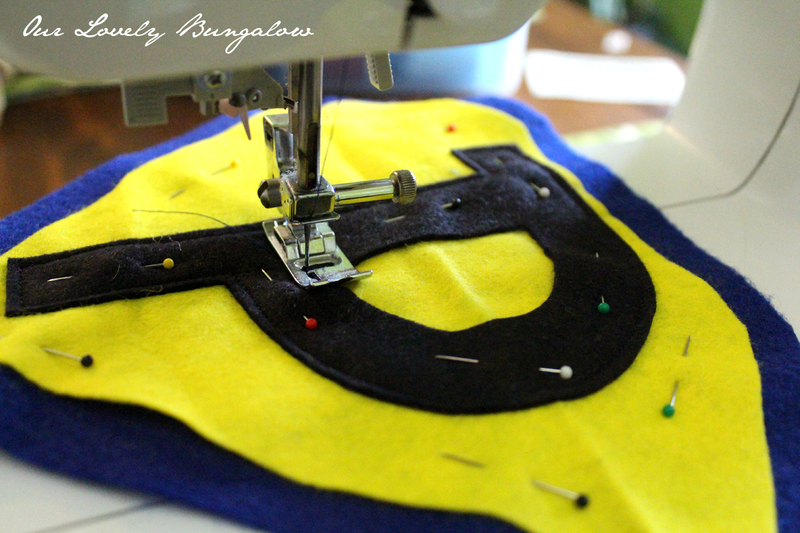 I made a shield shape out of blue felt with a slightly smaller shield in yellow. Then I drew a "P" on black felt to fit into the yellow shape and cut it out. To give it a finished look and to hold everything in place I sewed a border close to the edge of the felt layers. The red satin fabric I cut in a slightly tapered shape so the neck part wouldn't bulge too much when gathered for wearing. 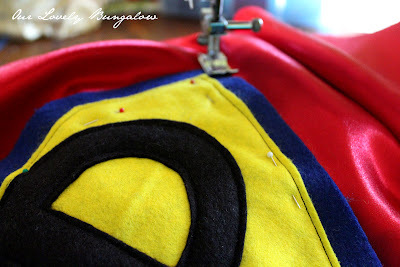 I then sewed the shield on to the red fabric by stitching a border close to the edge of the blue felt. 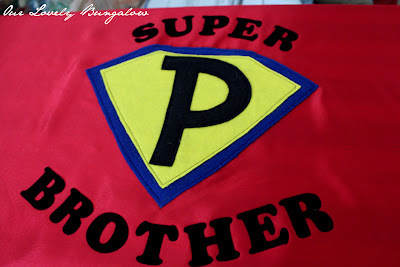 Then I ironed on the "Super Brother" letters. The package of letters I bought only had two "Rs" so I modified a "B" and the "Rs" to get 3 of the same "R" shape. I had two pieces of the satin fabric so I sewed the right sides (shiny sides, the one with the writing) together leaving a large opening at the bottom for flipping everything right side out and two a 1.5" gaps at the top for stringing ribbon through for wearing. I then topstitched around the the sides and bottom of the cape to keep the fabric from shifting and to close up the opening at the bottom. I also stitched 1.5" from the top of the cape to create a channel to keep the ribbon in place. I then strung 1.5" black and white stripe ribbon through the channel at the top of the cape for tying the cape on.